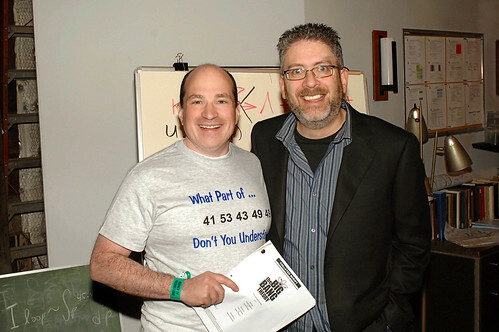 When I first met Dr. David Saltzberg, he was rushing by with a big box of multicolored dry-erase pens. As the science advisor for the popular sitcom The Big Bang Theory, he provides the technical content for each episode’s whiteboards as well as the scripts and other aspects of production. While someone on the crew has already transcribed his notes onto the boards, David reviews them before each taping begins, checking for any errors. Sometimes he catches “a Greek letter or a serif out of place,” he told me. As his guest to an episode’s taping last fall, he came out to greet me in the audience, and then rushed backstage to finish his rounds and get ready for filming. ©2011 WBEI. All rights reserved. When the science falls outside of his area of expertise, David knows where to turn. “At UCLA, people are one call or one floor away,” he explained. 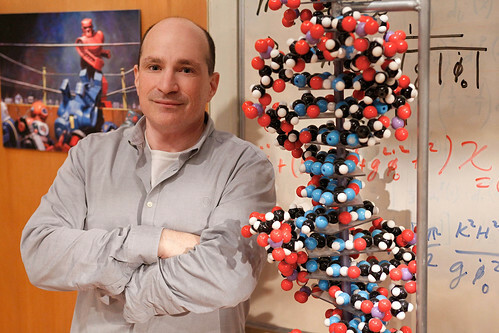 Sometimes he has to work on content a bit more removed from his research, such as biology or medicine, and then he consults experts such as a friend at the Salk Institute or the show’s own Mayim Bialik (who has a PhD in Neuroscience, similar to her character’s PhD in Neurobiology). During the tapings themselves, David largely gets to enjoy the fruits of his labors – the script’s science is in good shape, the whiteboards have received any needed corrections, and he sits with the writers as the episode is filmed. He’s on-call for any science emergencies, such as a last-minute calculation or clarification of how something is pronounced. In one episode, he had a brief cameo as an extra in a cafeteria scene, but usually he’s behind the cameras. ©2008 WBEI. All rights reserved. Maggie and I were thrilled to visit for another taping this season, and this time, we brought a microphone and talked to David after filming had ended. Enjoy the podcast! 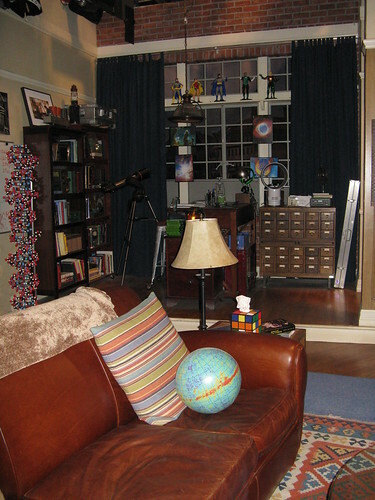 If you’re just tuning in, in the course of writing a feature about the WMAP beach ball, we were invited to visit the set of The Big Bang Theory to take a picture of the one they had on set. The article that started it all has an interview with Britt Griswold, who designed the beach ball. Just use the Big Bang tag for all of Blueshift’s entries on “The Big Bang Theory”. We have more photos of Big Bang Theory set on our Flickr account, and you can also read about the NASA things we brought that were featured on the show. Science is divine. The beauty of science lies in its dynamic nature. Once a theory is proven wrong, it won’t take a day to discard it and replace that with a new one. To subscribe to our podcasts, visit us on iTunes or add our podcast RSS feed to your favorite reader!